Former Los Angeles Lakers President of Basketball Operations Magic Johnson has taken to twitter several times since unexpectedly quitting his job prior to the Lakers' final game of the season. 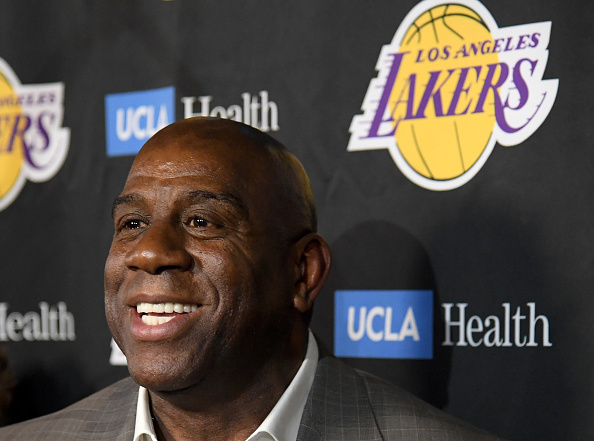 On Wednesday, Magic thanked the Lakers organization, including general manager Rob Pelinka and head coach Luke Walton, as well as his assistant and others. Today, Magic took to twitter again with a message for Lakers controlling owner Jeanie Buss. ". @JeanieBuss it was an honor and pleasure working side by side with you every single day coming up with strategy on how we could make the @Lakers better on the court and in the community." "It was a dream of your father and my mentor and father figure, Dr. Jerry Buss, for us to work together and it finally came to fruition." "I know how bad you want to win a championship for all @Lakers fans @JeanieBuss and under your leadership that will happen soon. I will always love you and will always be your brother from another mother. Laker for life!" TMZ Sports recently caught up with Johnson's wife, Cookie, who revealed that the Laker legend has "no regrets" about his decision. "Just know that [Magic Johnson] is happy and we're happy for him," says Cookie. "No regrets." According to a report by ESPN's Ramona Shelburne, Lakers' general manager Rob Pelinka will stay in his role in the wake of Magic's abrupt resignation, and he could even receive more power moving forward.